Another bumper field of more than 800 runners took part in the third and final Corporate Challenge evening – meaning 2,500-plus took part in this year’s series of three events. This year saw the 40,000th competitor cross the line since the series began in 1992. In the main senior race there was another new name on the winners board – Chichester 17-year-old Will Broom – while previous multi-winner James Baker recorded his 50th time of under 14 minutes for the 4,500m course, a testament to his consistency and fitness over the years. For only the second time in the event’s history, the winner of the main A race is still in the under-17 age group. Broom has been in impressive form this year on duty for Chichester in the national cross-country championships and for Sussex in inter-county and national schools events. Around the city-centre course Broom was content to stay with the leading pack for the first half of the race before striding clear to win in a time of 13min 24sec, the fastest time of 2018 and three seconds inside the under-17 record previously held by junior international Lachlan Wellington. Ten seconds back was Edward Dodd, who had double cause for celebration. 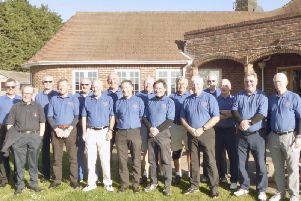 The Russell Giles Group runner helped his team to victory over Dstl Portsdown and Irwin Mitchell and clinched the individual series title ahead of Matt Gordon and Mike Houston. There was another dominant display from Rhiannon Dunlop to retain her women’s title with Lucy Thraves and Alice Wright occupying the next two places. Team-wise WSCC Ladies were too strong for Bosham Staff. It was youth to the fore in the sports team awards with Chichester Runners under-17’s and under-20s combining under coach Conrad Meagher as Conrad’s Lads and lifting the men’s title in front of Worthing Hares by five minutes with a fine aggregate time of 2hr 54min for the three races. There was a gulf of nearly 30 minutes in the women’s sports category with Chichester University too good for the rest. The primary-school runners had to be split into four races for the first time because of the increase in numbers. The Year 6 race was won by Joshua Dunne ahead of Toby Pickford and Rufus Edsell. Samuel Tonks from North Mundham was with Dunne until halfway until illness forced him to retire but his first two races gave him the series title by the narrowest of margins over Dunne, with Edsell third. In the boys’ Year 5 race James Taylor just came out on top in front of Frederick Salmon and Henry Court. Team-wise, Michael Rowe in fifth led Aldingbourne to their first team win in the event in front of Westbourne who had a two-second gap over Bosham in third. One of the most clear cut wins of the day was from Hattie Bond from Herne in the Year 6 girls’ race to win the overall title while the next two series places went to the top Year 5 runners, Florence East and Kitty Bryden, two more Hampshire-based athletes. There was local success in the team event with Jessie Younghusband having 30 seconds to spare over Bishop Tufnell and St Richards in third. In the boys’ Year 7 race Eddy Purser turned the tables on Fionn O’Murchu but could not prevent the St Philip Howard athlete from winning the series title thanks to his two earlier races, O’Murchu also leading his team to victory. Good packing from Midhurst Rother saw them end second while Bishop Luffa’s Harvey McGuiness claimed third individual overall and the same team spot for his school. Joe Mclarnon from Ditcham Park had a gap of nearly two minutes over his rivals in the Year 8 overall standings but was pipped by Cameron Walker-Powell from Mayfield in the final race with the two boys running two of the fastest times ever over the three-lap course of 6.35 and 6.36. Oscar Rothwell and Gabryel White occupied the next two overall places while St Philip Howard just got the better of Midhurst Rother for the team title. In the Year 9 boys’ race Bishop Luffa pair Adam Robinson and Douglas Smith were again ahead of the rest with Archie Sadler third, all three occupying the same places for the series. It was the same in the Year 10 boys’ race with Liam Dunne from Bohunt School returning after missing race two and setting another fast time of 8.21 for the four-lap 2.8k course. James Gardam from Bishop Luffa was a clear second in front of George Ashby from Portsmouth Grammar and these two helped their respective teams to the top two combined Year 9 and 10 places in front of St Philip Howard. Daisy Wilkinson from Brookfield School was again top Year 7 girl to clinch the overall title in front of Tilly Russell-Stoneham and Ellie Jefkins while Evie Pickford in fourth led her Bohunt team to victory over Felpham and Midhurst Rother. Olivia East from Mayfield made it three wins in a row to cinch the Year 8 title with Eva and Isobel Buckler occupying the next two places to secure the team win for Bishop Luffa ahead of Midhurst Rother. There was a new winner of the combined girls’ race with Year 10 former national cross-country champion Nicole Ainsworth leading home Holly Wilkinson and Isabelle Bryden, who claimed the top two places in the overall Year 9 standings ahead of Nina Moranne from Bishop Luffa. Team-mate Maggie King was absent from the final race but had done enough to win the girls’ overall title ahead of Jess Rayner from St Philip Howard and Phoebe Carlile from Portsmouth High. As with the Year 8 race, the combined Year 9 and 10 team race went to Bishop Luffa over Midhurst Rother.